In light of the raw material prices for precious metals as well as plastics all types of electronic waste recycling have become more and more important lately. Talking about e-waste we mostly refer to �white goods�. Used home appliances such as fridges, washing machine, coffee makers and so on. These products generally contain high value plastics and precious metals, in most countries they are collected separately or taken back by producers and dealers. But another important part of electronic waste recycling is recycling of all sorts of cables. 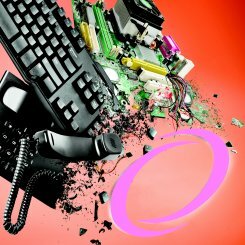 ZERMA offers a wide range of machines well suited for electronic waste recycling. Generally the recycling process starts by dismantling large parts like compressors or transformers. Then the whole product is shred in ZXS or ZSS single shaft shredders, after this step a rough separation of plastics, metals and other materials is possible. The materials are then further reduced in hammer mills and granulators, to achieve a finer separation. As the whole process of separating and classifying the materials is very complex and includes specialized equipment we generally work with system integrators and engineering companies to provide them with high quality size reduction components to be integrated into their systems. 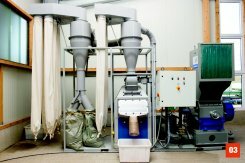 In the case of cable recycling, the complete cables are first shred to a size of about 30 cm in a ZSS or ZXS shredder and then ground down to their final size of 3mm in a GSH heavy duty granulator. This size allows for the best separation of metal and plastic on our separation tables. The separation tables split the plastic and metallic factions in a process involving both movement and airflow. Furthermore our machines are used by producers of electronic parts and components to destroy sensitive media, faulty products or prototypes. In these cases just a shredder or a combination of shredder and granulator is used depending on the required final size.